Dental Marketing, Websites & Patient Education | Optio Publishing Inc. Designed specifically for the waiting room, Optio TV allows you to show educational and entertaining dental videos in your reception. Set yourself up for online marketing success with a responsive dental website designed to attract new patients. Building trust through knowledge is the cornerstone of an effective online dental marketing strategy. On your website or in-office provide quality, dentist-reviewed dental education videos for your patients. We’ve helped hundreds of dental practices attract and retain patients. Call us today 1 (866) 906-7846. Offer more than the news or daytime talk shows for your patients. Optio TV features short videos that inform patients about current dental topics, oral hygiene tips, and popular dental services. You can customize the video mix to showcase services you offer or topics you want to highlight. Optio TV lets you introduce services in a friendly, casual way – and makes your chairside consultations quicker and easier. Engage your patients and increase treatment acceptance with high-definition videos on general dentistry procedures, oral hygiene, cosmetic dentistry, dental implants, orthodontics, and more. Available in your office for one-on-one consultation and on your website for broader promotion and patient questions. Display Optio Dentistry videos on your website, giving your patient the information they need to understand treatment. You can also email links or share videos on social media, making it easier to market your practice and specific services. Save time by playing patient education videos for your patients before a procedure, or use the slides to help explain the procedure in your own words. 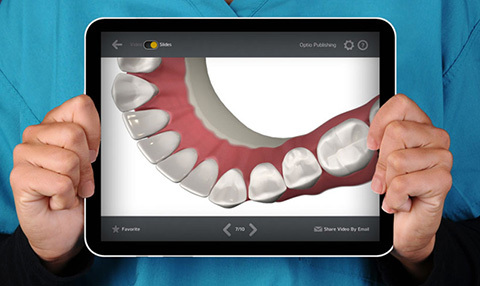 The Optio Dentistry App is available to meet your practice needs. Customized website designs based on your branding, colours and logo - because your office isn’t the same as the one down the street. We take the time to make sure your website reflects the personality of your office, which makes it easier for new patients to choose you. Designs that automatically adjust to mobile or tablet devices make it easy to find information, no matter the screen size. On-page search engine optimization makes it easier for search engines to find and index your dental practice site. Original text written for your dental practice and embedded videos make sure your patients have a unique experience. Content updates included, as well as security upgrades, hosting and technical maintenance so you can rest easy with the knowledge that your site is being properly managed. With more than a decade of experience designing websites for dentists we know what your patients are looking for and how to best engage them with information about your practice and your services. A good internet marketing strategy reaches, attracts, and retains prospective new patients. Boost your online presence with our proven and cost-effective tools. Optimize your web presence to get in front of more potential patients. Build trust by sharing engaging information with your community and use Facebook's advertising platform to reach new patients. Complement your SEO strategy with targeted ads that highlight your practice in Google search results. Attract new patients with our unique campaign-based approach to video advertising on YouTube and Facebook. We’ve worked with clients throughout the United States and Canada to hone our dental Internet marketing strategies. We take the time to understand your practice and then customize a strategy to reach your goals. Our multi-channel approach will increase the number of new patients your see each month and the number of prospects for high-value treatments, such as dental implants and cosmetic services.